Professor Duriarti, a famous criminal, has seized the farm and captured the animals! He cloned them and made the clones work for him to successfully fulfill his diabolical plan of earth's destruction. Through her network of informants, Supercow heard about the situation, and dashed off to save the farm animals. Because after all, who knows how to save the farm better than Supercow? 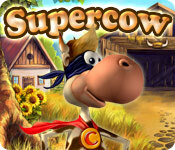 Supercow is an arcade game for the entire family! Easy and fun game play. Meet Flo and the other DinerToons as youthful DinerTeens, working their first summer job at Mr. Big’s theme park restaurants!